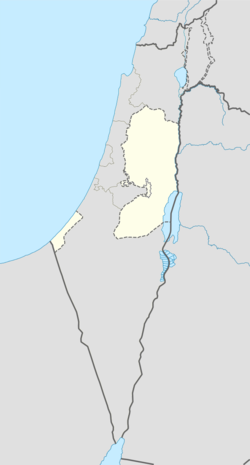 Eli (Hebrew: עֵלִי) is a large mixed Israeli settlement in the West Bank. 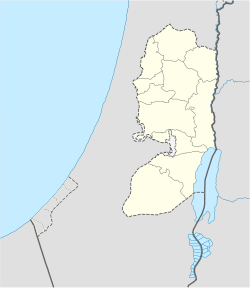 Located on Highway 60 north of Jerusalem and Ramallah, it is organised as a community settlement and falls under the jurisdiction of Mateh Binyamin Regional Council. It was named after the biblical high-priest who served in the Tabernacle in nearby biblical Shiloh (1 Samuel 1:9). In 2017 it had a population of 4,281. The international community considers Israeli settlements in the West Bank illegal under international law, but the Israeli government disputes this. Eli- named for the Jacobist prophet, Eli the Prophet- was established on 11 September 1984, when three families moved into recently placed buildings. It was the first settlement to be attempted without a core group of families. Several families from Ofra, Kokhav HaShahar, and Shilo were persuaded to come for at least a year while more families would be found. The settlement was originally called 'Givat Levona' after the adjacent settlement Ma'ale Levona. The Amana website states that the initial vision was creating 'one long territorial contiguity' of Jewish settlers between Eli and both Shiloh and Ma'ale Levona. According to ARIJ, Israel confiscated land from two nearby Palestinian villages in order to construct Eli: 1,551 dunums were taken from As-Sawiya while 623 dunums were taken from Qaryut. In recent years the town has evolved into the municipal center for the Shilo area settlement bloc. Eli is also home to the Bnei David pre-military Mechina academy. This yeshiva also offers post-army academic programs. Bnei David is the first pre-military Orthodox Mechina academy (1988), and was founded by rabbis Eli Sadan and Yig'al Levinstein. Many of the graduates have reached high rank in the IDF. It is an integral part of Eli, as many of the rabbis, administrators, graduates, and students live in Eli. There are currently over 500 students studying at Bnei David, and over 2,500 graduates, over 40% of them became officers, and the majority served in combatant or elite units. Shimon Peres has called it "Pride for the country". Graduates of Bnei David who died during their IDF service include Roi Klein, Emmanuel Moreno, and Amihai Merhavia. In 2013, the Israeli Civil Administration published a master plan (no. 237) which, if approved, would legitimize hundreds of the structures in Eli and incorporate Eli's four Israeli outpost, from the land of Palestinian villages As-Sawiye and Al-Lubban ash-Sharqiya, and Quaryut. It covers 1000 dunams, but would allow the expansion of other outposts to embrace 6,000 dunams, including privately owned Palestinian land. Within the plan's map, there are 7 Palestinian enclaves, where Palestinians may carry out agricultural projects, but are denied the right to build. The plan depends on declaring collectively owned Palestinian village lands in question as ownerless under Ottoman law, a classification which allows them to be defined as "state property" reserved for Jews alone. In 2013, representatives of the nearby Palestinian village of Krayot blamed Eli settlers for an alleged uprooting of more than 100 olive trees on their property. In January 2014, an Eli resident claimed to have photographed Palestinians chopping down an olive tree which a later report on Ma'an news blamed 'settlers' for the incident. In August 2015, a gas station was firebombed on Route 60 near Eli. Later, two Palestinian from Awarta, members of PFLP claimed the attack was a retaliation for the firebombing at Duma. ^ a b Amira Hass, 'Plan to legalize West Bank settlement of Eli paves way for its expansion,' at Haaretz, 1 June 2013. ^ "Israel's anti-gay rabbi is the fundamentalist monster among us - Opinion". Haaretz.com. Retrieved 2016-07-26. ^ פרס על המכינה הדתית בעלי: "גאווה למדינה"
^ Jack Khoury, 'More than 100 olive trees uprooted in West Bank, Palestinians report,' at [Haaretz] Oct. 19, 2013. ^ "Settlers blame: Palestinians faked price-tag". Walla!. 22 January 2014. ^ "Evidence: Arabs Staging 'Price Tag' Attacks, Blaming Jews". 22 January 2014. ^ "Settlers uproot hundreds of trees near Ramallah". Ma'an news. 22 January 2014. ^ "2 arrested for firebomb attack at Samaria gas station". Israel Hayom. September 30, 2015. ^ Raoul Wootliff, 'Two held for firebomb attack on settlement gas station,' The Times of Israel29 September 2015. This page was last edited on 25 March 2019, at 21:42 (UTC).